In 2013, Mamma Mia will be on the West Coast of Mexico, providing an unmissable opportunity to delve into this vibrant part of world. Offering a series of different beaches, capes and bays of all sizes and extensions. In terms of vibrancy of culture and richness of heritage, the Sea of Cortez is as diverse as they come. Tenacatita Bay, one of the largest bays on the Mexican Coast, is well worth a visit and the ideal site for crab, snail, clam, lobster and squid fishing. Due to its geography, it is also one of the very few places where you can watch the sun rise, and set, on the sea during winter. Yacht of choice: Built with these sunsets and al fresco dining in mind, Mamma Mia's extensive upper deck exquisitely frames the scenery whilst serving up some of the finest cuisine available from local produce. 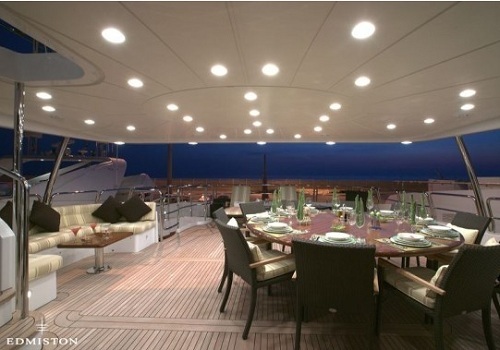 A crew of seven and on board suites for ten guests, she is a beautiful example of Zuretti's luxurious interior décor.